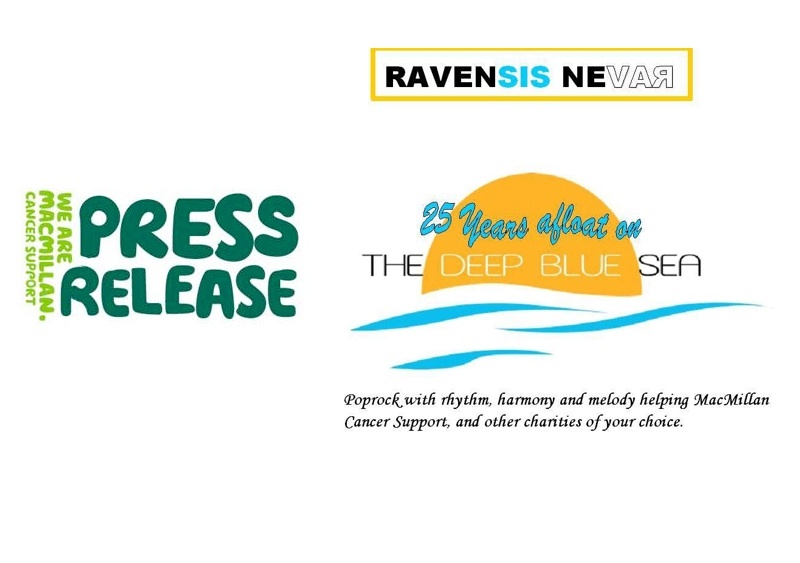 Ravensis Nevar continue to donate album and single revenue to Macmillan Cancer Support. Building on a well received first album, Glasgow band Ravensis Nevar release their second single 'Crystal Moons' with all proceeds going to the charity Macmillan Cancer Support. Their first single 'Sun Beats Down' received radio play, gathering interest surrounding the project and resulting in full support of local press and regional television. 25 Years Afloat on the Deep Blue Sea was 2 years and 3 months in the making, with 15 musicians participating in the project. David McAlister, Ravensis Nevar’s co-songwriter explains, "When compared to the previous 2½ years when we saw our music as a healing process. These last few months have been a breath of fresh air. Finishing the album lifted a great weight from our shoulders, and seeing it sell – where every penny goes to charity, has brought a great sense of achievement." Stuart Laing from the project added, "We hope that we have brought some fun sounds to all those who have bought it, and brought some hope to those in need of it most. We funded this full project from start to finish, and on completion we decided to donate it, and all proceeds from sales, to a fantastic cause." Purchase of CD and donations can be made through Ravensis Nevar's website http://www.ravensisnevar.com. The aim is to reach a £50,000 donation target through sales of the CD, and other musical fundraising events, and there is a tiered structure of donation where the public are invited to choose their option. Option 1 ensures entry into a Spanish Holiday Prize Draw with free accommodation at the band's villa and flights up to £500 on offer. Macmillan Cancer Support are working together with Ravensis Nevar on their ground-breaking charitable effort. Almost 97% of Macmillan’s income is through generous public donations. 1 in 3 people will be diagnosed with cancer at some point in their lifetime and it will be the toughest fight many will face. Macmillan Cancer Support's campaign delivers the message that that nobody should face that fight alone. The money raised will allow Macmillan to continue providing emotional, practical and financial support to people affected by cancer and their families throughout the UK. 25 Years Afloat on the Deep Blue Sea, containing an upbeat mix of pop rock harmony, is available as a CD and digital download on iTunes, Amazon plus all other major download sites.